A Liturgical Word Service will be held Saturday, February 16, 2019 at 10:00 am in the Sunrise Chapel at Walters Funeral Home for Horace J. 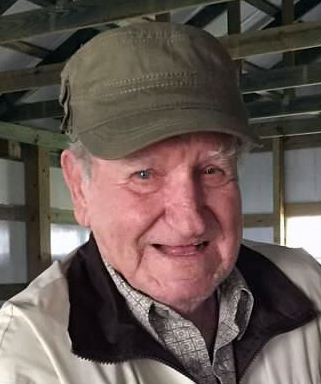 "Peedu" Hebert, 88, who passed away February 11, 2019. Father Garrett Savoie, pastor of Our Lady of Mercy Church in Henderson (also affiliated with the Sacred Heart Mission Chapel in Butte la Rose), will officiate the service. Lectors will be Sharon Tacker and Deborah Lockhart. Stephanie Hoffpauir, organist and vocalist, will perform, "Amazing Grace", "Ave Maria", "I Have Loved You", and "Be Not Afraid". Interment will be in Gallant Fields, the exclusive veteran's section of Greenlawn Memorial Gardens. Survivors include his wife, Julienne "Judy" Chiasson Hebert; three daughters, Cindy Guilbeaux and her companion Lee Nepveux, Carolyn Lopez and her husband Dennis, and Deborah Lockhart and her husband Reggie; one son, Troy Hebert and his wife Monica; six grandchildren, and seven great-grandchildren. He was preceded in death by his parents, the former Agnes Istre and Alcide "Cowboy" Hebert; three sisters, Ouida, Juanita, and Hazel; two brothers, Lawrence "Frere" and Robert Hebert; his son-in-law Gerald Guilbeaux; and his much adored canine companion, a red, miniature Doberman Pinscher named Chili. Horace was a native of Gueydan and resident of Carencro for the past 79 years. He was a veteran of both the United States Air Force and Army, serving during the Korean Conflict. He was a member of the Disabled American Veterans Commander's Club. For more than 25 years he worked as a sheet metal mechanic, and was a member of the Sheet Metal Workers Union Local #21. Peedu liked to "pass a good time" with family and friends. Many weekends were spent making memories at the family camp on False River. He enjoyed freshwater fishing, mostly for sac-a-lait, bream, and catfish; and hosted some great fish fries at the camp. Other favorite pastimes of his included trips to the casino, horse-racing, playing Bourree with friends, and spending time with his beloved granddaughter, Aniston. Pallbearers for the service will be Ronnie Hebert, Ivy Hebert, Jared Dupuis, Blake Chiasson, Klent Moreau, and Shane Romero. Honorary pallbearers include Justin Lopez and Lee Nepveux. The family requests that visitation be held Friday, February 15, 2019 from 4:00 - 8:00 pm, and resume Saturday morning from 8:00 am until time of service. A rosary will be led by Sharon Tacker on Friday evening at 6:00 pm.